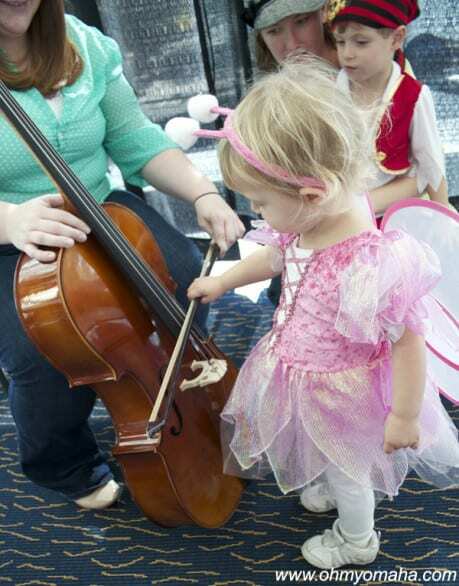 Review: Symphony Spooktacular – The Kids Sat Still! My kids went to a symphony concert and sat through almost all of it. I know! OK, this wasn’t just any symphony concert. Omaha Symphony put on its annual “Symphony Spooktacular” on Sunday – an hour-long production that catered to the tastes of antsy youngsters in itchy costumes. Farley was enthralled for the entire show. Unexpectedly, Mooch sat through most of it (only two potty breaks). This is a huge step for the 2-year-old. Have you ever gone to any of shows in the symphony’s Family Series? I think I’m sold on these. For the cost, you can’t beat the intro to orchestral music. Family Series shows start at the kid-friendly 2 p.m. time slot. An hour before the show starts, the lobby comes alive with activities based on the performance and the instrument petting zoo. Since this was a Halloween concert, there were spooky photo opps (including a fun photo booth). You might want to claim some seats before exploring the pre-show fun since it’s general admission. Tips: Don’t sit too close, no matter how much your kid begs, and aim for the center section for a good overall view of the orchestra. If your kid is likely going to need a potty break or a time out, claim the coveted aisle seat. The petting zoo was crowded but my kids got to try their hand at a few instruments. 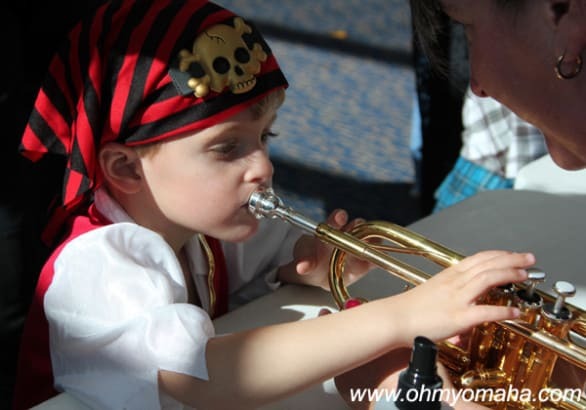 A trumpet-playing pirate. And by trumpet-playing, I mean he touched a trumpet and made no sounds. Don’t worry, they clean those things. The show itself is short by performing arts standards, and not at all boring. It opened with “Thriller,” for crying out loud. Many musicians wore costumes (there was a fun little costume contest during the show). It was all visually appealing, with a little mood lighting, the colorful costumes, the personable conductor Ernest Richardson, and of course, just seeing the instruments themselves. What kept the show entertaining for the young audience were “the extras”: The dancers, the martial artists (who did a “Star Wars” themed choreographed fight), and the Man in the Moon. After the performance, the kids were invited to trick or treat in the lobbies of the Holland Center. It was a mad house. Since the performance itself is so short, try to get your kids to go before it begins. The ushers stop you from returning to your seats during a song, so you will have to wait at the door until the song ends. I can’t vouch for the rest of the shows in the series, but the “Symphony Spooktacular” was a good show. I liked seeing my kids eyes light up when characters danced on stage, the “Whoa!” look on Mooch’s face during a particularly intense moment. Plus, I’m admittedly not able to sit through long symphonic performances, so one hour is good for me too. And everyone in my family liked the casualness of the day. Jeans are OK at shows like these. “Mozart’s Missing Memory” is next in the Omaha Symphony Family Series. It is Jan. 19, 2014, at 2 p.m. at the Holland Center. Tickets are general admission for $12.